Responsive layouts will work with both fixed and fluid body widths. You can set this option under the Layout tab within the Vertex configuration as shown below. If you are using the fluid width we recommend enabling the Max Body Width option. The site layout will still work on a percentage basis of the window browser, but this option will not allow the site to become any larger than the set pixel width. This is very useful if you don't want your site getting too large on very wide screen monitors. It also gives you some parameters to work with, so when you are designing you know that your site cannot become any larger than this value, rather than an infinite width. If you do not want to use this option simply leave it blank. 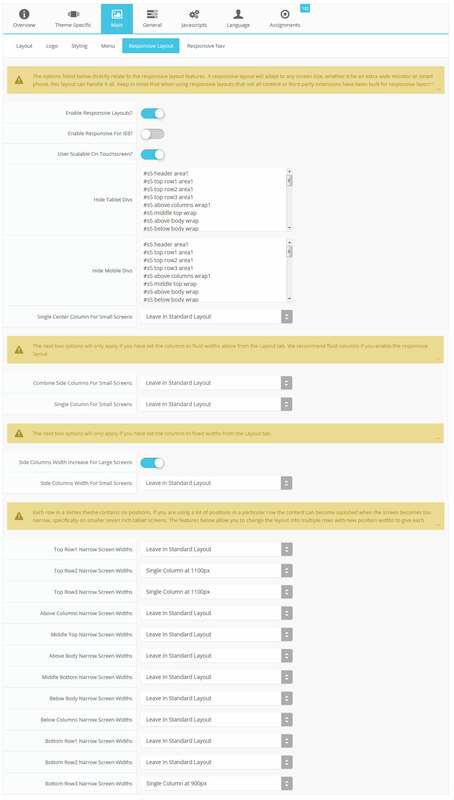 Depending on how you decide to set the width your columns widths, ie: fixed or fluid, you can set the columns to behave in a specific way for each of these settings. We highly recommend using fluid columns for a responsive layout. The Single Center Column feature will set just the middle_top, middle_bottom and articles into a single column. This does not affect the right and left and columns at all. This setting applies to both fixed and fluid columns The fixed and fluid sections each have two options underneath them. These parameters pertain to how you would like the right and left columns to appear at specific screen widths. Be sure to read the tooltip for each option for a full description of what they do. Even though you are using a responsive layout and there is no separate layout page for mobile devices, that does not mean that your site's viewers will understand this or even know what a responsive layout is. It has become a standard for websites that use a mobile layout to have a link to view the desktop view of the website, and this is what your site viewers will expect to see. This link simply turns off the responsive configuration using a cookie and calls the website like a standard desktop would when viewing in mobile. There is then a link to return back to the mobile view of the site presented. Images Percentage Width- This option will set all images in positions and articles only to the set percentage of this field automatically. Enter a number from 1 to 100 to enable it. It should be used as a last resort, but it is offered as an automatic solution. Image Auto Height- If an image has a max-width on it this will make the height automatically adjust to be proportionate to the image's width. For example if you have an image that's 200px wide, and it's inside a 100px wide div, the max-width:100% call will set the image to 100px. This option will make sure that the image height stays proportionate to the new width. We cannot think of a reason why this wouldn't be used so it's enabled by default. Image Max Width- This option makes sure that images cannot become larger than their available space. Enabling this feature will set images to a max-width of 100% (meaning 100% of the surrounding element's width). This option is highly recommended to keep enabled. Use the Image Percentage Width option described above. Again, this should be used sparingly, but if all your images are pretty consistently laid out then this offers an automatic solution for you. This is a great way to set the width for individual images. Using larger than normal images is probably the easiest way to setup full width images. For example if you have 700px of viewing space available on your site then simply use an image around 1000px in width. Do not specify a height or width on the image, and as long as you have the Image Auto Height and Image Max Width settings set to enabled, the framework will take care of the rest, and resize it to fit the available space. It is much better to reduce the size of an image rather than take a small image and stretch. Stretching an image to a larger size will cause the image to look pixelated. With this method you can still use method 2 on the image for very wide screens so that the image still stretches for those rare cases where it needs to be a little larger. Hide Sections of the Template via the Template Configuration This is the simplest way to hide an area of the template is to use the template interface to easily select areas of the template that you want to hide on tablet sized screens (970px and less) or mobile screens (580px or less). Simply select the area that you want to hide and the Vertex framework takes care of the rest! These fields do work independent of each other, so if you want to hide something on both tablet and mobile sized screens you must select the same area on both fields. IMPORTANT - If you turn off a column position such as right or right_inset something else must be in the same column or the layout will not work. The area that the column belong will still show if you decide to hide it. If you have only a specific module/position that you would like to hide at certain screen sizes, and not an entire section of the template, this is the best approach. A hide class is a class that can be applied to any element on the page and hides that particular element at certain screen sizes. Classes range in 100px increments for large screens and 50px increments for small screens. Below are some examples, and at the very bottom of this page there is a list of all the available hide classes. Use these sparingly if you can. As a recommendation, the primary target of these classes should focus on tablet and mobile sized screens. Wide screen monitors vary in size so it's much harder to use these classes correctly for large monitors. Tablet and mobile devices are much more consistent in size so it is much easier to apply the smaller hide classes. The class is simply put into the title of the module/position. There must be a space just before class= , and don't worry, the class area of the title won't actually show on the live site, it's only shown in the backend. It must be entered exactly as shown above. The title can be published or unpublished, it does not matter which. Simply adding the classes to the title will apply the classes to the entire module/position. What if you want it to hide the module/position only for a certain range? That's easy just add _only to the end of the class name. hide_900_only will only hide that element from 900px to the next increment in the hide classes, which is 850px. So it will only be hidden from 850px to 900px. You can also add multiple classes to the title like this class=hide_900_only hide_850_only which will apply both classes to the module/position. What if you want to hide the module/position and then show it again later? That's simple, use show_ in the class instead of hide_. This will make the module/position show for the specified size no matter what other settings are on the module/position. So if you want to hide the module/position from 1000px and below, but you want to show it again later then do something like the following class=hide_1000 show_600. This will hide the module/position from 600px to 1000px. Why would someone use hide_all? This is a great tool for anyone wanting to show content only on a mobile or tablet sized screen but hide it on all other devices. To do this you should use class="hide_all show_mobile". The hide_all will set the content or module/position to display:none on all devices, and one the screen size reaches mobile size the show_mobile will override the display:none and show the content. If you have only specific content or images within an article or module/position that you want to hide then use the same hide classes described above, but wrap that specific content inside of the class instead of applying it to the entire module/position. For example, in the image below, the third paragraph will hide at 900px and then show again at 700 px. THE BLOCK SHOW CALLS ABOVE CAUSE A LAYOUT ISSUE WHEN TRIGGERED.